FILE - In this Feb. 22, 2019, file photo, a man is frisked by a U.S.-backed Syrian Democratic Forces fighter after being evacuated out of the last territory held by Islamic State militants, near Baghuz, eastern Syria. FILE - In this Feb. 22, 2019 file photo, U.S.-backed Syrian Democratic Forces fighters stand guard next to men waiting to be screened after being evacuated out of the last territory held by Islamic State group militants, near Baghuz, eastern Syria. Nadim Houry, the director of the counterterrorism program at Human Rights Watch, said “it is hard to imagine” setting up an international tribunal on sovereign territory without that country's approval. Previous efforts to get Security Council backing for international tribunals for crimes committed in Syria have failed, mostly because of vetoes by Russia, a main ally of Damascus. 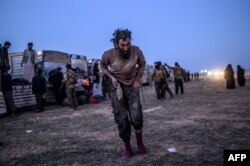 A man suspected of belonging to the Islamic State group walks past members of the Kurdish-led Syrian Democratic Forces just after leaving IS' last holdout of Baghuz, in the eastern Syrian province of Deir Ezzor on March 4, 2019.